Nestled in the heart of the White Mountains, the Kancamagus Highway has a history as long as the road is winding. Lovingly known as “The Kanc” by many locals, the Kancamagus Highway offers unparalleled scenic views through one of the Northeast’s largest national forests. It also provides access to an abundance of scenic overlooks, campgrounds, and hiking trails. 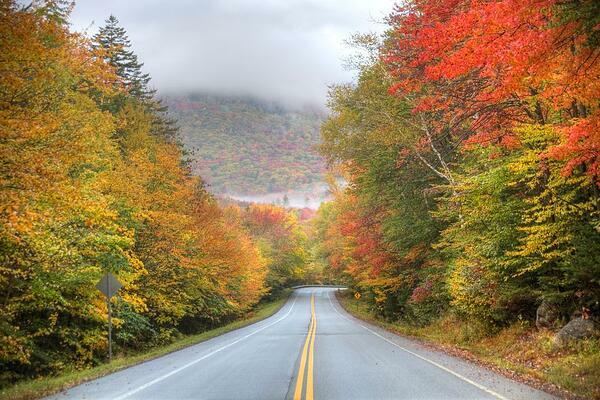 The Kancamagus Highway dates back to 1600s when local Native American tribes lived along the famous route. The highway started as two small town roads – one in Lincoln and the other in Passaconaway. In 1937, 100 years after the road to Passaconaway was completed, the two town roads were extended and connected to create one road. In 1959, the Kancamagus Highway was officially open to traffic. Many deemed the dirt road to be dangerous, and the highway was finally paved in 1964. The highway was named after Kancamagus meaning “The Fearless One.” He was the grandson of Passaconaway, who united over 17 Native American tribes in New England in 1627. When Passaconaway passed after in 1669, Kancamagus ruled the Panacook Confederacy until the settlers waged war in 1690 against the tribes. Kancamagus led his people to northern New Hampshire and Quebec. 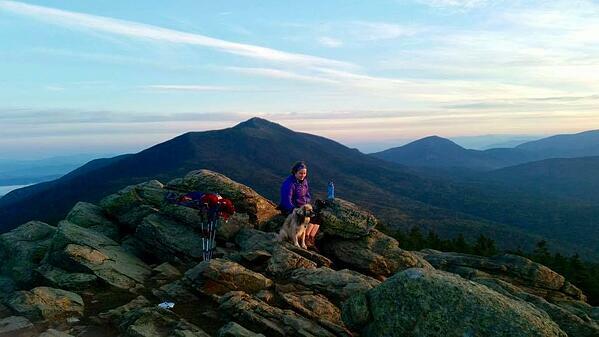 Many of the famous peaks and towns in the White Mountains are named after famous Native Americans, like Mt. Chocorua. Chocorua was the chief of the Ossipee Tribe. The town of Conway gets its name from Passaconaway. You’ll also see a history of the settlers in the area. The Russell Colbath House was built in the 1830s and used by the family for farming and logging. The US Forest Service operates the historic home as a house museum and information center in the summer and fall months. The Kancamagus Highway, also known as New Hampshire Route 112, is a 32 miles two-lane, paved highway through the White Mountain National Forest from Lincoln to Conway. Approximately 26 miles of the highway is designated as a National Scenic Byway by the United States Department of Transportation. The route is a popular tourist destination, especially in the summer and fall foliage months as there are lots of scenic views, hiking trails, and campgrounds along the highway. 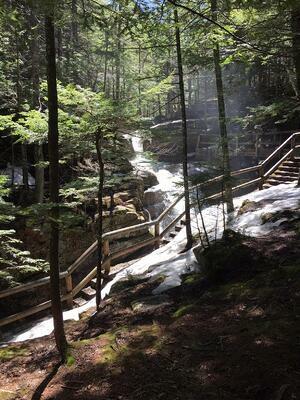 Located on I-93 close to Route 112, the Flume Gorge is one of the best attractions of the western side of the Kancamagus Highway. The Flume is a natural gorge rising 800 feet from the base of Mount Liberty. The famous gorge was accidentally discovered in 1808 by 93-year-old Jess Guernsey while she was fishing. It’s truly a spectacular site that you have to see at least once in your life. On a warm fall day, nothing feels better than dipping your feet in the cool waters of Diana’s Bath. Located in Bartlett, Diana’s Baths is a cascading 75-foot waterfall surrounded by shallow pools and smooth rocks perfect for swimming or resting your tired feet. No matter where you look on the Kancamagus, you’ll find scenic views of the surrounding White Mountains. Located approximately half way along the Kanc, Pemigewasset Overlook offers breathtaking views of the Osceola Mountains. The CL Graham Wangan Overlook provides beautiful views of the Swift River Watershed. The overlook was once used as a meeting place by the Native American natives in the 1600s. For some of the best fall foliage views, don’t miss Sugar Hill Overlook near Lincoln. There are many waterfalls along the Kanc that are easily accessible by foot. Nestled about a half mile from the highway near Conway, Sabbaday Falls is one of the most beautiful waterfalls in the White Mountains. With a 45-foot drop and a handicapped accessible trail, Sabbaday Falls is a popular spot to enjoy a picnic. Nearby, you’ll find Rocky Gorge, another popular waterfall near Conway. Walk along the Swift River until you reach Falls pond and you’ll find the 10-foot waterfall. If you’re looking for a bit more of a hike, Champney Falls is located about 1.5 miles from the highway. Champney Falls is a series of cascades about 70 feet long and is best viewed after a good rain. Lower Falls is easily accessible with parking and nice little cascading falls down the river, during the summer months, it's a popular spot to dip your toes in the water and relax on the rocks. With a variety of hiking trailheads located on the Kancamagus, it’s hard to know where to lace up your boots and hit the trails. Starting from the eastern side of the Kanc, Moat Mountain Trail near Bartlett is a 7.9-mile out-and-back trail with excellent 360-degree views from the top. Nearby, Oliverian Brook Trail is a slightly shorter trail at 6.6-miles that is commonly used for hiking and trail running as it’s relatively flat. Potash Mountain is a 4-mile out-and-back moderate trail up to the scenic summit of Potash Mountain at 2,870 feet. The trail is lightly trafficked and offers great views from the ledges above. For a long hike in the Whites, Hancock Notch Trail is a 12.6-mile trail located near Lincoln on the western side of the Kanc. 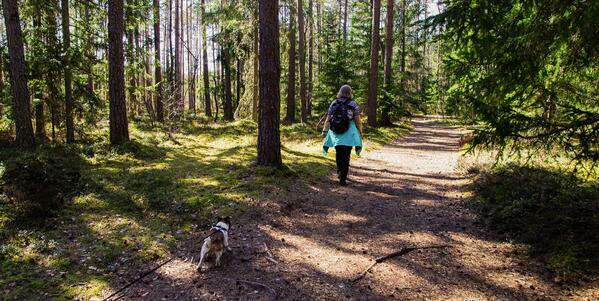 If you’re not ready for an all-day hike, the 1.7-mile Cedar Brook Trail is a great alternative. Of course, the Lincoln Woods Trail is always a local favorite. If you’re not keen to drive the Kancamagus Highway twice, you can make it a full loop and drive through some of the other historic towns of the White Mountains via Route 302. 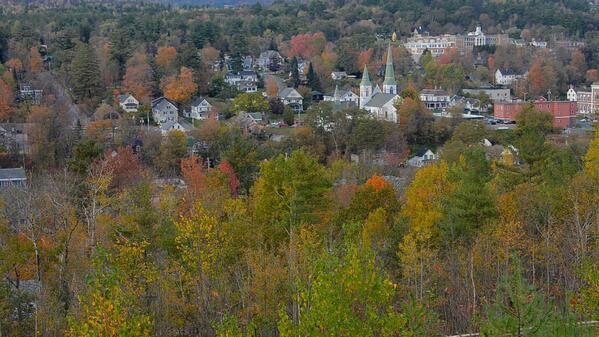 Stop in North Conway for some outlet shopping. Catch a glimpse of the historic Mount Washington Hotel and Bretton Woods before winding your way through the historic towns of Bethlehem and Littleton. Hop on I-93 South and find your way back to Lincoln. 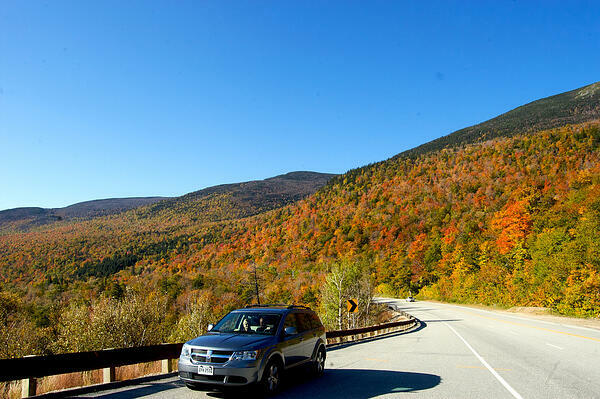 As the leaves start to burst with color in the coming months, hit the road and discover the natural beauty of New Hampshire’s famous highway through the mountains. Need a place to stay during your trip along the Kanc? Reserve your suite at RiverWalk Resort in Lincoln, the start of the loop!